They had no idea the old missionary, a woman with a gammy leg, a facility for the local languages, and a domineering manner, was still there. When she moves back into the mission house with them, the difficult situation of managing the local interpretation of Christianity – centred around the need to cast out the devil in nightly vigils filled with singing, young women writhing on the ground and screaming as the evil is exorcised, along with holy water sprinkled around evil properties – is made worse by the additional burden of her presence. Bea, while trying hard to perform well as the missionary’s wife, is also attempting to farm and find friends without any knowledge of island customs, language or foliage. She keeps on accidentally making herself ridiculous, but she keeps on trying. Max attempts to understand and quietly make inroads into the local Christian beliefs and tries to convert other islanders, battling the demons of cultural confusion, misunderstanding and his own need to dominate and be the civilising force. Alongside these narratives are those of I. A. M. Jonson, the local British government official, who is there to report on the development of an airstrip highly unlikely to ever be properly built, and a pair of badly treated foreign workers from the local farming complex who are trying to flee to the mainland to save their baby from a measles outbreak. There is no western medicine; no running water apart from streams, rivers and the ocean; and the jungle with its barbed vines, its animals, its poisoned plants, its insects, is everywhere, creeping into and over any untended life. The intensity of the physical and emotional extremes of these lives is compelling. Sweltering heat, drowning rains whose ‘bullets of warm water … splattered crowns of mud in the air’, endless insect bites, the labyrinthine nature of the jungle in which any stranger is instantly lost, alongside a need for spiritual and physical companionship makes for a visceral and heady combination that takes its characters to even greater extremes, offering the reader a privileged position outside of the maze of cross-cultural misreading that leads so many characters into a kind of fevered desperation from which the strangest of actions can seem the only logical course. 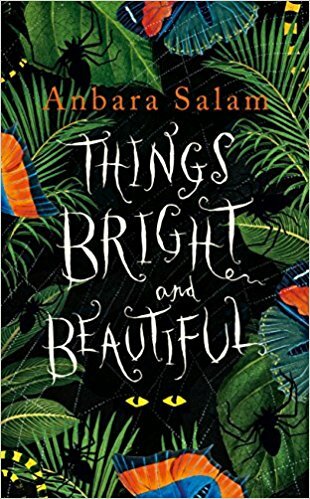 I thoroughly enjoyed the moral and cultural complexities of Things Bright and Beautiful though this is more a novel for the sceptic than the believer. 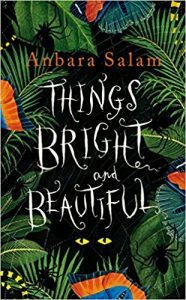 Filled with thoughts on cultural and religious colonisation, Things Bright and Beautiful is a fevered delight. Though these thoughts are mostly from an expat perspective, the whole idea of belonging, of fitting in, of acting correctly, of social cohesion, makes Things Bright and Beautiful very relevant to a modern global world. Jonson and Max both have their own way of looking at the different world around them, but they also both believe they should somehow be able to control it, to save it and those around them, women in particular. The local spiritual leader, Aru, and indeed Marietta the old female missionary, are much the same. A colonising spirit is a dangerous one. Bea’s approach is different and her story the one that ultimately sings through the madness.